Why rent a city clunker when you can get a race-spec carbon road bike instead? Whenever I visit a new city, one of the first things I try to do is get hold of a bicycle. It frees me from the expense and hassle of taxis, buses and trains, and it allows me to cover much more ground than walking. I really think that there is no better way of discovering a city than by bike. This particularly applies to Berlin, which I made a return visit to this summer. While huge, Berlin is also flat, there are dedicated cycle paths pretty much everywhere, and there are plenty of bike hire options to choose from. Which Berlin bike rental option you choose depends on the sort of riding you are planning on doing when you visit. Do you just want to potter slowly around the city or would you rather get around with a bit more pace, and have the option of heading out of the city to explore the surrounding Brandenburg countryside? If you’re staying for more than a couple of days, I’d recommend the latter, as there’s some great cycling once you get out of the city. The simplest, but least inspiring, option is to grab one of the many solid-but-boring bikes which are dotted around the city. In Berlin, examples include Mobike, Donkey Republic, Lidl Bike, Limebike and Nextbike. These bikes are unlocked by an app on your phone. You then ride to your destination, lock it again, and you’re billed for the time you were using the bike. Some of the bikes, such as Nextbike, must be hired and returned to docking stations. Others, such as Mobike and Limebike, are dockless, meaning you can just leave them wherever you like (parked legally, obviously). Limebike also offers e-bikes, if pedaling around a flat city sounds like too much effort. If you want to step up a level, Fat Tire bikes at Alexanderplatz offers “trekking bikes” from £16.75 a day. There’s no app here. Simply book the bike by phone or on the website and collect and return it at the Fat Tire shop. If you rent the bike for more than a day, the daily rate drops. The trekking bikes are more capable than the city bikes mentioned above as they come with 7-speed Shimano Nexus hub gears, making them more suited to longer rides. I rented one of these bikes for a week on a previous visit to Berlin and while it got me around, it did so in what I would call a utilitarian style. What if you don’t want to compromise on speed, quality or style with your bike rental? Then what you really want is a proper lightweight road bike, and they don’t come much better than the Canyon bikes you can hire from the Rapha Clubhouse in Berlin Mitte, which is just a short walk from Hackescher Markt. To be eligible to hire one of these rather lovely rides, you need to be a member of the Rapha Cycling Club, which costs £135 a year. As a club member, you can hire bikes from any of Rapha’s Clubhouses. That means that you can get yourself a high-end Canyon road bike (they're all Canyons) in locations which include Berlin, London, Amsterdam, Copenhagen, Los Angeles, New York, San Francisco and more. There’s a full list of locations on Rapha’s site. So if you travel to major cities more than a couple of times a year and you want to be able to ride at your destination without lugging your own bike with you, this is likely to be a major appeal. There’s a lot more to be had from an RCC membership, too: organised weekly rides, exclusive club kit, complimentary coffee at Rapha Clubhouses, and other benefits. Renting a bike from a Rapha Clubhouse costs £15 ($25 / €20) per day, and you can hire a bike for a maximum of three days at a time. Optional damage and theft liability waiver is also available for £5 ($10 / €7) per day. Given the value of the bikes, I would take that insurance, and if you hire the bike for more than a day, I'd also make sure you have somewhere safe to store it overnight. When you rent the bike, you can also also borrow a Wahoo Elemnt bike computer free of charge. Note that you cannot hire helmets, pedals, lights, bidons, etc., so remember to take your own. And unless you’re feeling lucky, you should probably also pack a spare inner tube and tyre levers. 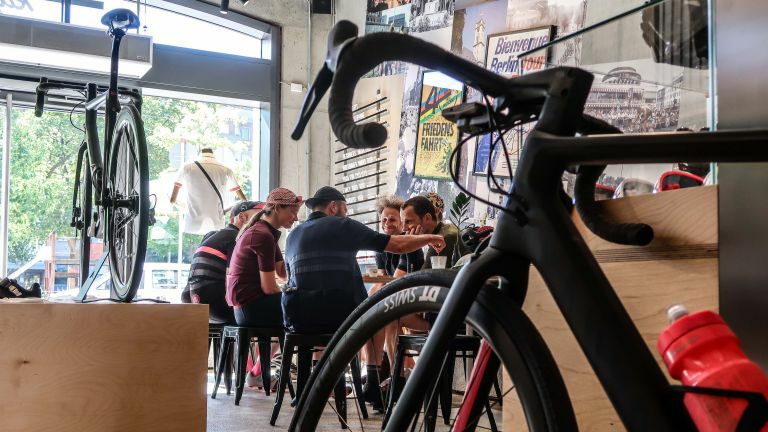 The bikes on offer at Rapha Berlin are carbon frame Canyon Ultimate CF SLX models with Shimano’s Dura-Ace groupset, fast-rolling DT Swiss wheels, aero bars and hydraulic disc brakes. They’re lightweight, really well specced in terms of components and, as I discovered, ridiculously fast. Once I’d arrived at the Rapha store, I found Steffen, the local Rapha Cycling Club Coordinator, who set up my bike for me, got me to fill out a couple of forms, and then I changed into my bike gear and headed off. The whole process took perhaps 20 minutes. If you’re not used to riding a race bike with this geometry it will take you a little while to adjust to it. The riding position is fairly aggressive – high seat and low front end – and the steering is so responsive that it initially took me by surprise. This was a lot to take in when I was also trying to avoid tram lines that were the perfect width to swallow my wheels, as well as trams, buses, cars, other cyclists and meandering tourists. But once I’d got away from the crowds and ridden through the Tiergarten from the Brandenburg Gate to the Victory Column on a long, straight, three-lane road that was temporarily closed to cars I felt entirely at home on the bike and started to really enjoy its capabilities. From there, I headed out on one of my favourite cycling routes out of the city: riding west towards Halensee and then down through the Grunewald forest to Wannsee. From there, you can go ono Glienicker Brücke – the ‘bridge of spies’ – which connects Wannsee to the Brandenburg capital of Potsdam. It’s on these longer rides where the Canyon really comes into its own. The dedicated cycle routes are much smoother than the paved cycle paths you’ll find in the city and the bike encourages you to get your head down and give it some pace. And if you give it a bit too much pace, and someone steps out in front of you, the hydraulic disc brakes provide ample stopping power. It’s also on these longer rides, where the bashed up commuter bikes and flea market purchases become outnumbered by higher-end road and mountain bikes, that the Canyon, with its super-cool, murdered out matte black colourway turned the heads of other riders, who nodded appreciatively as we passed each other. As a premium bike rental experience, I can’t fault the RCC bike hire service. The staff at Rapha were friendly and helpful and the the bike was an absolute dream to ride. If you want to hire a bike for your city break, and you want the very best, then this is the way to do it. As you'd expect from a quality brand, Rapha bike clothes don't come cheap. We think the kit is worth paying for, but we're always up for a good bargain. If you want to pick up some Rapha kit at sale prices (some of it is a massive 50% off) then hit the links below.